Video: Drop Test Galaxy S III Vs iPhone 4S, Which Stronger? Some time ago a video appeared on YouTube that shows how HTC One X is used as a hammer . In the video, One X that uses the Super IPS display with protection Gorrila LCD2 Glass slapped many times for driving nails into a log. Interestingly, no blisters on the smartphone. More recently, the siteAndroid Authority conduct a test of endurance race on the Samsung Galaxy S III and Apple iPhone 4S .In testing, the second smartphone dropped a few times with different positions. Height range to fall around the chest to the neck of adults. As a result, the smartphone body are damaged. While the Galaxy S III which uses Super AMOLED display and protection of Gorilla Glass 2 also experienced similar things. 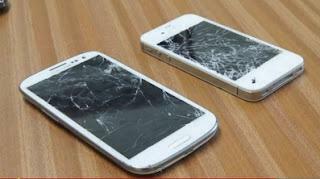 However, when compared with the rupture on the iPhone screen 4S, screen Galaxy S III are less prone to damage. Watch the following video.